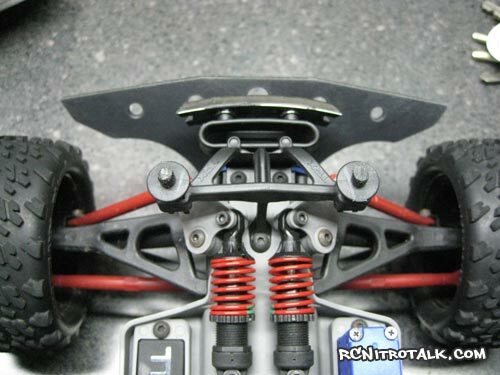 The Traxxas 1/16th E-Revo is wickedly fast, however the Mini E-Revo doesn’t offer much protection up front. The stock bumper is basically non-existent and leaves a lot to be desired from a protection aspect. This is where T-Bone Racing comes in with their new Mini E-Revo Thrasher bumper. The T-Bone Racing Thrasher bumper is HUGE, in fact while looking at it from head on you notice the bumper extends from one wheel to the other which completely protects your a-arms, push rods and toe links. The Thrasher doesn’t stop there, on the bottom it also covers your steering servo linkage. In other words this bumper completely protects your front end. The mini e-revo Thrasher bumper is made of 3.5mm thick nylon. The nylon provides more than plenty of strength for the bumper while also remaining a bit flexible to help absorb impacts without damaging the bumper or your mini e-revo. Installation of the Thrasher bumper is simple, easy, and very quick. 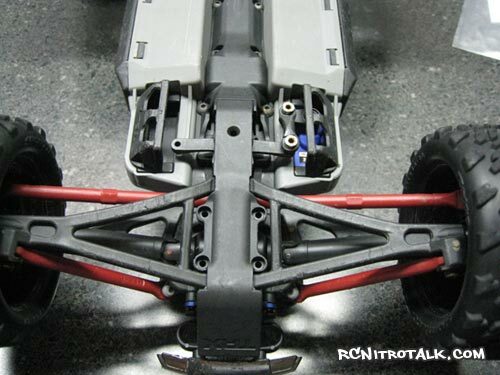 First start by removing the 5 screws that hold your front skid plate in place – do NOT remove the front skid plate, the Thrasher bumper will be installed over top of it. Next you’re going to take the included stand offs and place them in the following area. 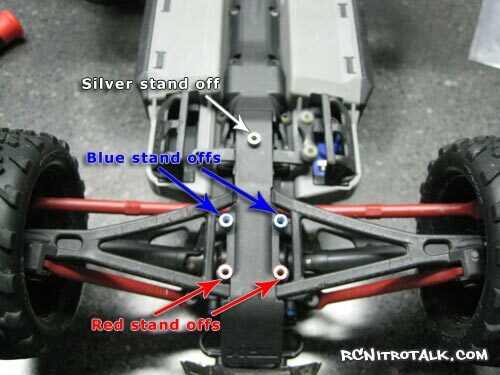 The red stand offs go in the front two holes of the stock skid plate, the blue stand offs go in the two holes just behind the red stand offs and the last short silver stand off goes over the steering linkage hole. Once the stand offs are in place you just use the five M2.5×16 screws included with the bumper and attach the bumper to the mini e-revo. Five screws and stand offs and that’s all there is to it. Takes just minutes to install and dramatically increase the protection of your mini e-revo. Total front end protection, both in front and under the chassis. 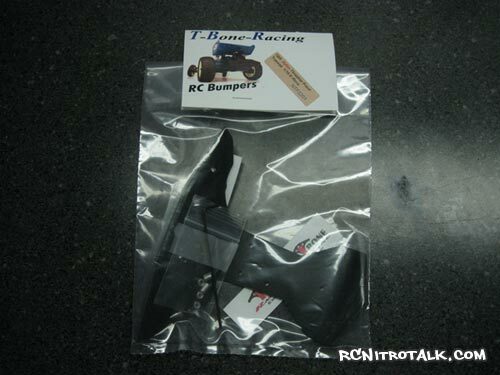 Unbeatable warranty – if you break the bumper, T-Bone Racing will send you another bumper for FREE! Easy installation and low cost. Might be too big for some peoples likes, however this bumper was designed to give you the most protection available and does exactly that. 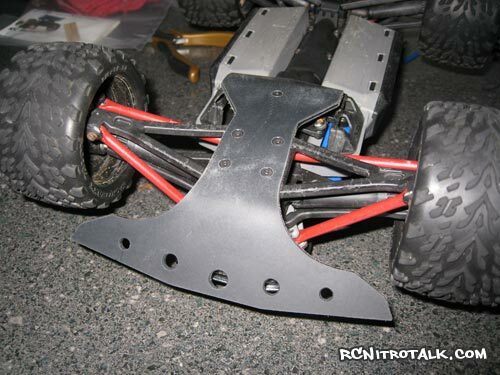 In the end I would recommend this bumper to anyone that’s looking for more protection for their 1/16th E-Revo as the T-Bone Racing Thrasher bumper will do just that and does it extremely well. If somehow you do manage to break the bumper, T-Bone Racing will send you another Thrasher bumper absolutely free. You just simply can’t beat it – go check out T-Bone Racing!